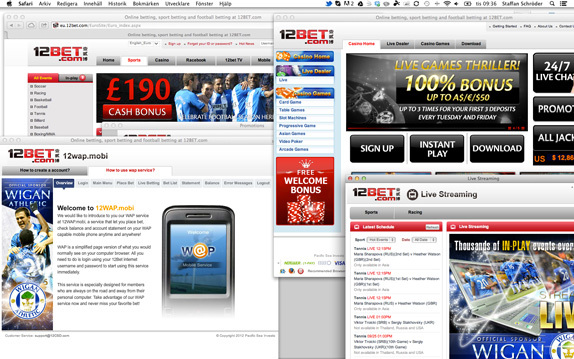 12Bet.com, a sportsbook which targets the european and asian market, has a really confusing navigation model. The site consists of a tab navigation (Home, Sports, Casino, Racebook, 12Bet TV, Mobile, Promotions and Affiliates) which works pretty well as the main navigation areas. But the big problem is the way the tab navigation works. It opens up most tabs in new windows which makes the player seasick. You don’t really know what will happen when you click on the navigation. Image 1. You have five different browser windows after clicking on each tab. It gets even more confusing if you select the casino tab, find the browser window and try to play. There is for instance a left navigation “Casino Games” that opens a new window with the game details for the link you click on. And nothing happens when you click on “PLAY NOW” for a game when using Safari on the mac. So 12bet.com should really look over their navigation model, if you need help then let me know, which would improve the player experience so much!